Angels are around us every day, everywhere. In addition to being messengers, angels are also rescuers. Acts 12, for instance, describes how an angel was sent to release Peter from prison. After waking him up and telling him to get dressed, the angel walked him right out of the prison, accompanying him the full length of one street and assuring that he was safe before leaving him. Afterward, he said, “Now I know without a doubt that the Lord sent his angel and rescued me . . ” so he went to the home of Mary, the mother of John (who was also called Mark), and told the people gathered there how he had escaped. On April 29, 1976, my father underwent open heart surgery for the first time. He was 57 years old; I was 19 and about to receive my Associate of Arts degree from San Joaquin Delta College. I planned to transfer to a college in Orange County in the fall of that year. I remember being incredibly frightened because my father had, as far as I knew, been healthy until then. And fathers are supposed to be invincible — strong providers for their families, especially their daughters. In reality, my father had been ignoring symptoms of heart disease for some time. The local physician who treated him for many years described him once as “stoic” — an apt characterization of a man who stubbornly kept overhauling Lincoln transmissions, despite attacks of angina, because his youngest daughter was set to head off to college. Nothing was more important to my parents than seeing their two daughters graduate from college, secure steady jobs and be self-sufficient. So it was quite shocking when my father went to the hospital to have surgery for a hernia, but instead ended up coming home that same morning with an appointment to see a cardiologist in Sacramento the next day. At that moment, my world changed forever: It was the point in my life when I learned, as every child eventually does, that my parents were vulnerable beings. He ended up undergoing bypass surgery two days later. It was performed on an emergency basis following an angiogram. His pulse was 26, his blood pressure dangerously low, and the doctors almost operated that very afternoon. But after intense consultations and numerous tests, they concluded he could be stabilized until the morning. I will never forget coming back from the hospital late that night, completely exhausted, to get a few hours of sleep before returning extremely early the next morning so that we could see him prior to the operation. In 1976, open heart surgery was not yet a common procedure and I had never dealt with a family member’s serious illness or injury, so I was overwhelmed. I remember getting into my bed but being so tired and emotionally drained that I could not sleep. Throughout this ordeal, my mother’s demeanor could best be described as serene. I thought that she was just putting on a brave face for her daughters. That night, the light stayed on in my parents’ bedroom for what seemed like hours. I left her alone because I figured that she was probably doing exactly what I was doing, i.e., crying, worrying and trying without success to get some much-needed sleep. Eventually, I dozed off and it seemed like only a few minutes had passed when she woke me to get dressed and head back to the hospital. Again, I remember thinking to myself that she was quite an actress because I saw no sign of strain, worry or despair. At that point, my parents had been married for 35 years during which my mother had never worked outside our home, so I was convinced that she had to be scared out of her wits about not only my father’s medical situation, but what the future might hold for our family as a whole. He came through the surgery spectacularly, returned to work for another eight years, and would survive an even more extensive and risky open heart surgery in 1989. I remained at home for an extra year before heading off to college because after that crisis, I simply was not ready to leave the nest. And it was not until after my father had convalesced and resumed work that my mother finally explained why she had been so calm, assured and strong. It was not an act at all. She had been genuinely confident of the future. The night before his surgery, she had gone into their bedroom and remained awake, as I suspected. But she was not tossing and turning due to worry and fear. In fact, she was not even in their bed. Rather, she was alongside the bed. On her knees. Immersed in prayer. Later, she described how she knelt beside the bed and began having a conversation with the God she had known from the time she was baptized at the age of three months in the little white Lutheran church in South Dakota. She simply explained to her higher power that if her husband could be healed, she would be forever grateful. And if he could return to work, that would be wonderful, but if not, she would figure out a way, with his help, to put food on the table and send her daughter to college. Since she was never able to attend college, given that she had the misfortune of graduating from high school in 1934 when this country was mired in the Depression, she could self-identify only one marketable skill. So she told God that she would “take in ironing if [she] had to” in order to “make ends meet.” She also reminded God that they owned their home — yes, the very house in which I write this — “free and clear” so if she needed money for medical expenses, she figured God would help her mortgage it. She said it was then that she felt it. On her shoulder. Firm and reassuring. And real. She described feeling that hand on her shoulder so powerfully that she turned around, expecting to see me standing there, thinking that she had not noticed me come into the room while she was praying. But I was in my own room. At that moment, she explained, she finally understood “the peace that passes understanding.” She felt calm, peaceful, assured. She knew that my father would be fine, the medical bills paid, and normalcy restored to our daily lives. That’s why she was able to reassure her daughters, be a rock for us and model not just the ability to be calm and deliberate during a crisis, but, most importantly, faithfulness. I have known from the moment more than 30 years ago when my mother told us that story that there was an angel in this house on that night. In my parents’ room. It was an angel whose hand she felt on her shoulder. That angel was a messenger sent by the God she knew so well to bring her comfort and the indescribable peace that overcame her that night. And to empower her to be an example to us. I do have a “collector personality” — I collect and surround myself with representations of angels in various forms in my office (hidden from visitors), car and, especially, here at home. Among my prized possessions are a pair of gold angel earrings that my clients gave me when we won the Superior Court trial in Conservatorship of Wendland. Angels serve as reminders to me not only of my father’s recovery and my mother’s steadfastness throughout the 16 years he remained with us after that first medical crisis, but also of several personal experiences I have had with angels — and demons — in the ensuing years. My angel collection tangibly reaffirms that we are never alone. There is a battle waging around us at all times that we cannot see or hear . . . but it is being fought on our behalf by the angels dispatched to watch over and care for us. They bring messages from time to time. They definitely rescue us, even though we may not always know it. 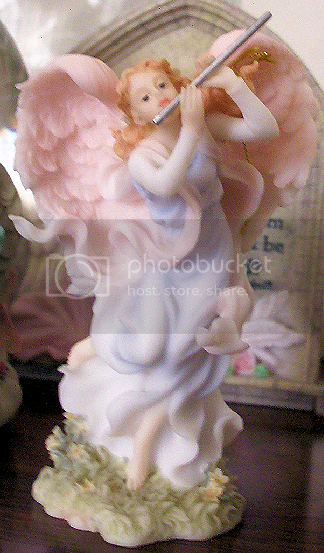 Since taking up the flute a few years ago, the focus of my collecting has been angels playing flutes. Two of my favorites are pictured here. If I Did It — Would You Have Written It? This is a marvelous and uplifting story about your mother’s experience with her angel. I don’t blame you for collecting them. 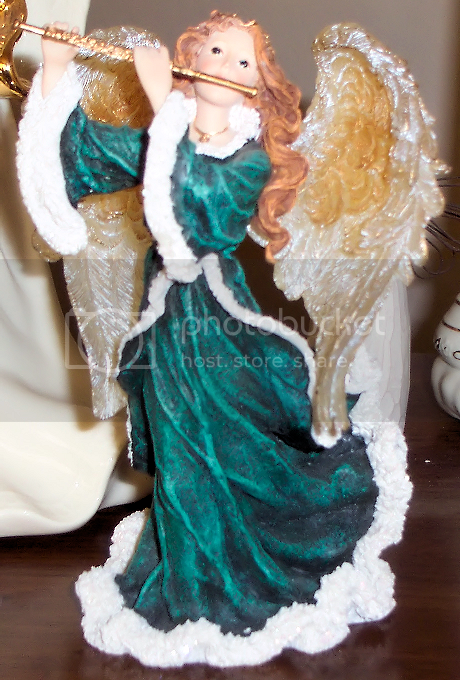 I always lean toward angels at Christmas time, and have a number of ornaments and figurines. Perhaps I should give some thought to keeping them near me year round. I am not the world’s most religious person (far from it) nor am I the most spiritually inclined, but I have a special fondness for angels. Lovely story. Inspirational and life affirming. Beautiful story. I agree angels are there everywhere. Even in good times and bad times angels are there always to help us. We sometime have to go through such big events in life which are not so happy but Some power which is always standing besides us gives us the strength to fight every situation in life. And I am sure it must be some angel only giving this strength. What an inspirational story! I truly believe there are Angels out there looking over us. Thank you for joining us at the Carnival of Family Life. That was so uplifting! Great story! I have not seen yet a real angel with halo and wings and everything like that but i believe true angels are those people who love us and care for us. Thank’s mom for being my angel! A great story and your beliefs shine through strongly. Thanks for sharing the story. It’s very powerful. I had learnt to put faith in angels long time back when in troubled times. But had completely forgotten about them. This story was like a gentle reminder; a nudge to me in that direction. This is a moving story. When I read about the hand on your mother’s shoulder I got chills. Surely there was a presence there. Thank you for this post. Definitely strengthens my belief in my own angel!